November 2009 issue on sale now! | What Hi-Fi? November 2009 issue on sale now! What's more, all our subscribers and anyone who buys the magazine at Tesco stores will get a free pair of THX Optimizer glasses. These can be used in conjunction with any DVD disc fitted with the THX Optimizer to calibrate your TV to perfection. Want to know more? Then check out our special THX feature on pages 32-33 where all is explained. We've a host of exclusives for you this month. There's a new budget surround speaker package, the £550 Q Acoustics 2000, Denon's AVR-3310 multichannel receiver, Onkyo's intriguing new ND-S1 iPod dock, plus a stereo amp from the same company, Sony's PS3 Slim and superb KDL-46Z5500 HDTV and a £499 turntable from Pro-Ject. And let's not forget Pioneer's SC-LX82 multichannel receiver, a bargain £169 Blu-ray player from Philips, TEAC's Reference 600 mini hi-fi system and Roksan's Kandy K2 CDS CD player. Naturally we've got a Supertest of flatscreen TVs. This month we turn our attention to the hotly-contested 32in sector, with budget models from Alba, Hitachi, LG and Toshiba, and premium sets from Panasonic, Philips and Samsung. There's one clear winner, but which will it be? If you're looking for an all-in-one Blu-ray system to go with your new TV, we've tested a trio of those too, from £450-£600. LG, Samsung and Panasonic battle it out. Or maybe you'd rather build a system of home cinema separates? In which case don't miss our Group Test of £800-£950 multichannel receivers, in which Denon's brand-new AVR-2310 goes up against the Pioneer VSX-LX52 and Onkyo TX-NR807. Of course, this wouldn't be an issue of What Hi-Fi? Sound and Vision without some serious hi-fi, and there's plenty to cast your eye over. Cyrus, Moon, Naim and Roksan are the key contenders in our Group Test of £1250-£1450 stereo amplifiers, and we've been listening long and hard to speakers from i.US, Monitor Audio, Dali and Wharfedale. In our Temptation section you'll find our verdict on the Leema Tucana II stereo amplifier, Chord Electronic's extraordinary Indigo iPod dock/DAC/preamp and an upgraded version of Clearaudio's Emotion SE turntable. That still not enough for you? Then check out our Roundups of bargain HDMI cables and AV equipment racks. 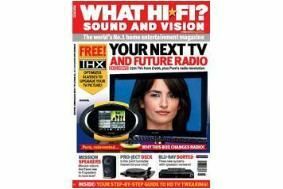 The November 2009 issue of What Hi-Fi? Sound and Vision is on sale now. And don't forget you'll be able to see all our Award winners, and hear some of them in action, at the Manchester Sound & Vision Show running over the weekend of October 17th-18th. Keep checking on whathifi.com for regular updates on the show, plus all the latest hi-fi and home cinema news, reviews and videos.